I read recently that Australia could easily produce enough energy to meet the needs of the entire planet, and all from clean, renewable sources. It is obvious to anyone with half a brain that the technology already exists to reduce pollution without destroying our comfortable lifestyles. Of course once the oil runs out this will not longer be true. I’m pretty sure with our present technologies we need oil to build the infrastructure – the wind turbines and solar farms – that will help us to free ourselves from our dependency on oil. We are still arguing about the merits of alternatives. Soon we won’t have the luxury of creating alternatives. We won’t have the resources we need to transition to new ways of generating energy. 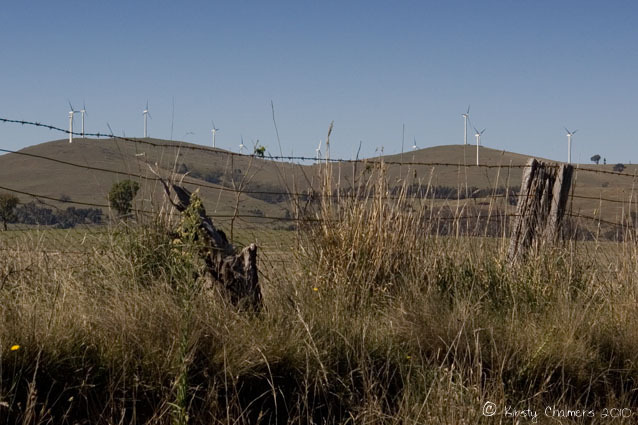 There are still plenty of Australians arguing that we should reject wind power because the turbines don’t look nice. Lets just get on with it! ah yes, I so agree, and these ones actually came with a special viewing platform! Hey, fully, time to get into gear ! Looks like the Waubra wind farm? had a great chat with a local bloke out there about how the Spanish company Acciona annually puts a cut of profits into local community bodies, such as the footy club, the kinda and the CFA. also how much the hosting properties were earning, for some it was enough to retire on ! all very positive community relations, only concern is now some folks are saying they are being poisonned by the electro magnetic radiation … which is wierd, the only time i went up close to a big wind turbine, which was down at Tura, i got a headache, which then subsided as soon as i drove away …. I thought we were arguing about not wanting to give up the cash cow that is the oil industry?! But hey, at least if its the merits of alternatives, it is a small (though staggeringly insufficient!) step…. Yes, I guess it depends on who’s arguing we are talking about. Everyone has an opinion. I just think it’s time to move on from discussion (not to mention our PMs futile search for consensus) and do stuff! ‘Because the turbines don’t look nice’……..unbelievable! Better to look at these than devestation. I actually see them ‘waving; not shaking their fist:) Great photo Kirsty! Thanks Lynda. They seem quite benign to me, and hey, they produce power from wind. Not a bad result, is it? I absolutely fell into your photo today, Kirsty. This is similar to the picture I have in my mind of Australia. I know there is much more to your beautiful country, but the books I have read make me see what you have photographed, above. On the topic of other forms of energy, I am with you on this one! We have the means to create other forms of energy. I want that so much. I have read books on this topic and about wind farms, solar panels and hydro power. In the US, our energy grid needs to be perfected and some things changed by the government that will ensure our movement into this area. Incentives of the almighty dollar need to be offered up to those companies forging ahead and Higher taxes upon those producing unclean energy. That’s what I understood from what I’ve read. One thing that concerns me about wind energy, because of something I read in an article written by a bird specialist, is that the pathways of migratory birds need to be considered when building our wind farms as thousands are killed by these windmills. I would be more concerned about that than the beauty of them, as such. He did not say we should not build them. He said be WISE! It seems we are either too slow or rush too quickly into things. There needs to be a steady trek forward and soon. We need to take into consideration the benefits and then consider the effects, of anything we do, on our environment. This time, we need to get it right. There has been a great deal of discussion here about the birds, in fact this was famously used by a politician as a reason to stop development of a wind farm a few years ago. I understand that research has shown it to be extremely unlikely that birds will be injured by turbines as they turn quite slowly. Even so I’m pretty sure they are required to check the path of birds before choosing a site. Thanks for your lovely comment about the photograph. It’s true that this is typical of large areas of Australia. You can drive for days through this type of countryside (I have many times). Leslie has a point about doing things ‘right’ or at least trying to think before just doing whatever–but I don’t think that is any serious obstacle to doing what needs to be done –by us. I don’t think the US government is going to do a darn thing at this point. All positive change and implementation must come from us in our daily lives. “We” are going to have to change “them” by leading the way by example . Spread? Okay, where’s the butter knife? I’m willing to spread such words! Beautiful photo. And yes, I’m ready for some wind/solar power and anything else we can do to reduce our dependence on oil. I’m all for every household have solar panels and wind turbines and maybe a water wheel depending on their usage. Thanks Richard. I think the UK is doing better with wind turbines that we are in Australia. I’ve heard of some wonderful community projects where villages share their wind power. Water wheels were used a lot in the past weren’t they? Why not, such simple technology! Hi. Wanted to thank you for the link you posted to that great video!!! Did a post for it. Feel free to send like material my way if you’re so inclined.